Featured today is a truly fantastic and an exceptional gem. 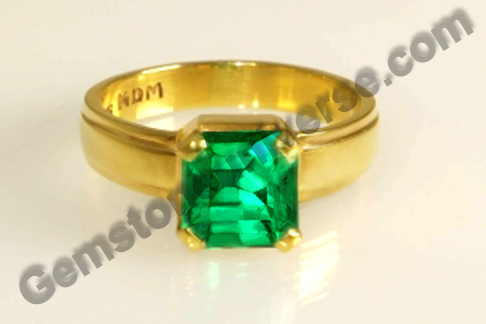 It is a fully natural Colombian emerald of 2.21 carats set in 22-karat gold, as a Mercury talisman ring. The gem is spectacular for it is practically the exact shade, which is classified the premium emerald green in the trade circles. It is an exotic, deep rich enchanting green – most coveted and rare! This Colombian beauty has the classic emerald cut (step cut) and excellent clarity. Colombian emeralds are renowned globally for their vitreous lustre and great clarity levels. However, what makes this gem exceptional is the fact that it has the deep rich emerald green color and has excellent levels of clarity. Such gems in which more than one factor are found in combination are fairly rare and therefore command a premium. In Vedic astrology, natural emerald is the gemstone of the planet Mercury/ Budha and can be used to harness its power. Emerald or panna made into a talisman can be used to advantage by an individual for whom Mercury is a karaka in the birth chart. Speech, communication, trad, commerce and logistics are the domain of Mercury and people pursuing career in these field can benefit amply. 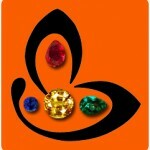 To view the natural emerald gemstone prices and inventory please click here.